First wallpaper submitted here! Haha, well. It features Rorona and Totori from one of my favourite PS3 JRPG's--the Atelier series. It's kind of a simple wallpaper, but I like my wallpapers simple. The pattern used in the border comes from here; everything else was done by myself. (: And of course, the scan is from Minitokyo. This is very nice but please update your wallpaper with your signature on otherwise it will be deleted. 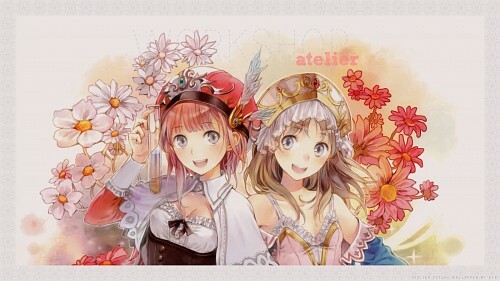 Rorona and Totori at wallpaper! I like it. I'm agree with you, simple is more beautiful! Very pleasant wallpaper, it has a nice touch to it. Nothing shiny, but its simplicity makes it a wonderful one. Perhaps the only sad thing about it that it only has Rorona and Totori, it'd be nice to see Meruru in it too, making a three heroines in one wall would be awesome. Quote by WeskaliaVery pleasant wallpaper, it has a nice touch to it. Nothing shiny, but its simplicity makes it a wonderful one. I'll be sure to do that for my next wallpaper! I've just been playing Atelier Totori a lot lately. But thank you very much! Thank you for your kind sharing the wallpaper.